Readers Poll #42: What is your favorite Sabrina Jeffries series? What is your favorite Sabrina Jeffries series? I did some writing while in Vegas, which was a surreal experience because Warren’s book involves gambling, and it definitely enhanced the writing experience to be in a city so dedicated to that. 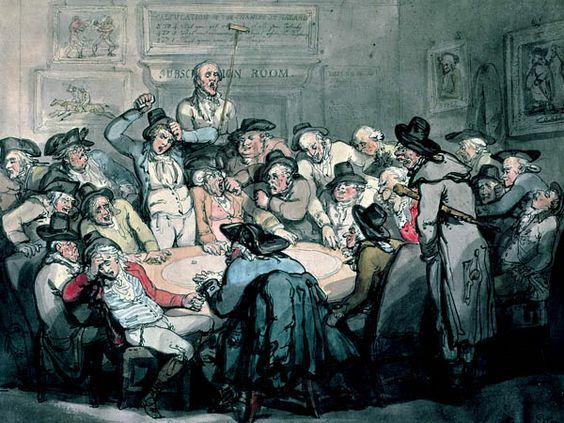 Most Regency bucks gambled primarily in private clubs (like St. George’s) or gaming hells. My book concerns the latter, since I wanted to have a sort of tavern/gaming hell combo where tavern maids served the men. I had to scour the internet for period descriptions and images of hells, which is how I was reminded of Crockford’s, a club run by a former fishmonger. Originally he worked in a gaming hell, and I found an excellent article at the Smithsonian magazine about it. It’s clear from the article that gaming hells were designed to cheat the customers at every turn. I guess we know why they were called hells! As usual, the house always wins, one way or the other.